Welcome to the Searl's Newsagency website. From this site you are able to access a huge range of quality stationery at very competitive prices. Just browse through our online store and place an order today. 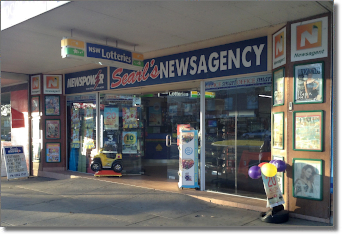 You will also find lots of information about all we have to offer in our Newsagency and NSW Lotteries Agency, located at 412-414 Banna Ave Griffith NSW, just follow the links on the Newsagency and NSW Lotteries menus on the right. With our friendly personal service you will appreciate all we have to offer as your local Newspower Newsagency & NSW Lotteries Agency. Should you need any assistance just ask our friendly staff in store, or here online just click contact us.